1) Pre-heat your oven to 400 degrees. 2) Roast the corn in the husk for eat for 15 minutes then remove from the oven. 3) As soon as you take the corn out of the oven place it in an airtight container. This will allow the steam to cook the corn keeping the corn moist, rather than drying it out by roasting it for too long. Let sit for at least 20 minutes. 4) When the corn has cooled off remove the husk and lay it down on the cutting board. Using a sharp knife; slice the corn off parallel to the cutting board. A delicate touch here will give you the best presentation for the final salad. 5) Once all the corn kernels are removed it's time to prepare the dressing. a. Using the back of the knife, scrape the cobs to remove the corn milk. b. Pour the corn milk into a blender and add 1 tablespoon honey. c. Start the blender and drizzle in 2 tablespoons vegetable oil and S&P to taste. Drizzle the dressing across a clean plate and dust the plate with salt & pepper. 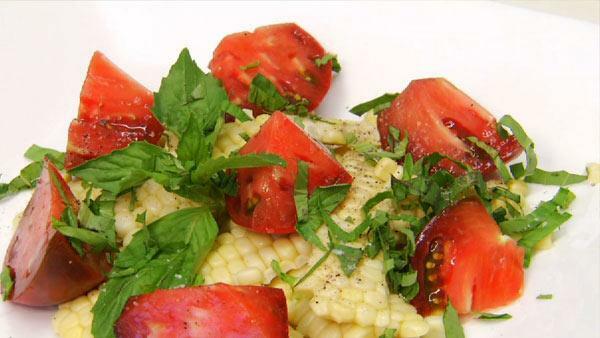 Create some height by layering the corn and sliced tomatoes however you like. Top with fresh basil and a little more salt and pepper to finish. Enjoy with a light bodied white wine. **The preparation of the corn is the key to this salad and dressing. Chef Ben Paula fell in love with the kitchen growing up cooking with his dad in their family home in Massachusetts. While attending Endicott collage out side of Boston, Ben got his 1st chance to directly influence the output from a restaurant kitchen while creating daily menus as Sous Chef for the Wild Horse Cafe. He liked the challenge and the satisfaction of creating the dishes, and knew eventually he wanted to open his own restaurant. While assisting world renowned "Fear no Ice" ice carving performers with an exhibit at the Vail Cascade resort, Ben caught the eye of Chef Jesse Llapitan. Chef Llapitan offered him a position at the four-diamond Vail Cascade Resort and a year and a half later invited Ben to join him as Banquette Chef for the grand opening of the St. Regis Hotel in Los Angeles. Following a tremendously successful opening Chef Ben was asked to take over as Executive Sous Chef at the Universal Sheraton where he gained invaluable experience in catering and event execution. Ben then decided it was time to return to the more intimate restaurant scene and left the hotel industry, moving to San Francisco in 2003 where he revitalized the menu at Charlie's on Union. After serving as Chef and GM for Charlie's Ben decided the time had come and struck out on his own with Sauce in Hayes valley. From blazing chainsaws and 400 lb blocks of ice, to razor sharp knifes and blistering saut� pan's Chef Ben rises to any challenge, and creates from the heart. In his first restaurant venture he does a bit of everything; from personally hand crafting the redwood bar during construction, to delivering the extra ladle of gravy to a table in need. Chef Ben's love comes through in every aspect of Sauce and his food and personality resulted in its ranking #2 in the "Best new Restaurant" category of San Francisco Magazine's 2004 readers' poll. Signature Chef Ben dishes, ranging from portabella mushroom fries to bacon wrapped meatloaf, will warm your heart as well as fill your belly, and like Ben himself, always deliver just a little more than you expect. For more information about executive Chef Ben Paula with Sauce Restaurant in San Francisco visit www.saucesf.com.